The Colombian government and the FARC-EP continue the talks in the Cuban capital Havana despite a recent setback after an unannounced visit of FARC negotiators in northern Colombia. 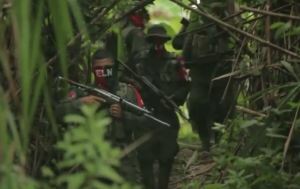 Meanwhile, troops of the country’s second-largest leftist guerrilla, the ELN, have allegedly been spotted in traditionally FARC-controlled areas. The ELN and the government have been holding preliminary peace talks to bring the 51-year-long civil war to a complete end as the administration of President Juan Manuel Santos comes under increased pressure from the Democratic Center party for making too many concessions to the guerrilla. 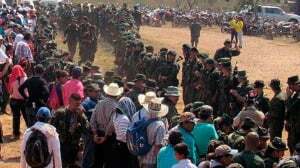 Colombia’s National Indigenous Organization ONIC stated on Sunday, that troops from Colombia’s National Liberation Army (Ejército de Liberación Nacional – ELN) have been spotted in areas controlled by the Revolutionary Armed Forces of Colombia – People’s Army (FARC-EP). ONIC notes that the ELN increased its presence in FARC controlled areas after the FARC-EP, in June 2015, declared a unilateral ceasefire and after the Colombian government, in return vowed to end its air strikes against FARC-EP positions. ONIC Chief Councilor Luis Fernando Arias noted that “while the presence of the FARC has diminished, the presence of the ELN increased in some of the country’s regions.” The FARC-EP and the government have implemented a bilateral ceasefire that officially came into effect on January 1, 2016. Arias noted that the ELN’s presence had been reported in Valle del Cauca and Cauca, two provinces in the west of Colombia and home to important drug routes to the Pacific. The Office of Colombia’s Ombudsman also noted that ELN attacks as well as non-violent manifestations had been observed in areas where the ELN has no traditional presence. The development has led to some speculations about whether or not some FARC-EP fighters have joined the ELN, as the FARC-EP and the government are expected to sign a final peace agreement this year. The signing of the peace accord would lead to the decommissioning of the FARC’s weapons, monitored by international observers, and the transformation of the FARC-EP into a non-militant political organization. Allegations about FARC-EP fighters “swapping sides” and joining the ELN could not be independently verified by nsnbc international. The possibility that this happens in isolated incidents, however, cannot be excluded. This is particularly so because many of the underlying socio-economic and political factors that prompted many to join the ranks of the FARC-EP have not yet been mitigated. These include, unemployment, the need for rural and political reform, access to education, the mitigation of extreme poverty and others. The ELN and the Colombian government have been holding preliminary peace talks. The ELN also issued an official statement, declaring its readiness to take the talks from the preliminary stage to the official stage; that is to the negotiating table in Havana, Cuba, where the FARC-EP and the government have held peace talks since 2012. The ELN also issued an official statement in which it complained about the fact that the government’s contact had not provided a new date and time for a new meeting, as usual. Lack of progress with regard to the government’s slow pace with regard to include the ELN in the official peace talks has resulted in some attacks, signaling that the ELN still is “present” as an armed force to be reckoned with. Not all of the attacks attributed to the ELN could, however, be confirmed as such. It is, for example, questionable whether the ELN was responsible for the mortar attack against the barracks of the Colombian Army’s 18th Brigade in Arauca, earlier in February, or whether the attack was a “provocation” organized and carried out by elements who want to derail the peace process. It is noteworthy that Colombia’s Democratic Center party, led by former president Alvaro Uribe called for a march on April 2, to protest what Uribe described as the Santos administration’s excessive concessions to the FARC-EP. Meanwhile, the FARC-EP and the government continue peace talks in Havana despite a recent setback. Courtesy the Office of the Ombudsman. 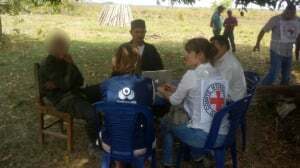 The setback came when FARC-EP negotiators including Chief Negotiator Ivan Marquez paid a visit to some 500 FARC-EP soldiers and the population in Colombia’s northern La Guajira province. The government blasted the FARC-EP for violating agreements about negotiators refraining from public outreach initiatives. The presence of some 500 FARC-EP soldiers at the event also put the local military commander in a quagmire. The government and the FARC-EP have since then discussed the need for FARC negotiators to convey some of the progress that is made at the negotiating table directly to the people and to local FARC-EP commanders. It is noteworthy that the FARC-EP, only days after the event, relieved the first of an estimated 2,000 child soldiers from his military service.